I must be some kind of impressive liar! 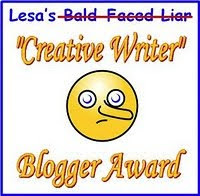 I was tapped for the Bald Faced Liar "Creative Writer" Blogger Award TWICE, once by Marisa Birns at Out of Order Alice and again by Laura Eno at A Shift in Dimensions. Thanks, guys! 1. During my brief stint with the U.S. Navy, I served on the USS Chicago, a nuclear attack submarine. 2. During my brief stint with the Michigan Legislature, I represented the city of Petoskey (Leelanau County) for a single term. 3. During my brief stint with Milan's La Scala ballet company, I danced Swan Lake. 4. During my brief stint with NASA, I once worked on the space shuttle Columbia (while it was on the ground). 5. During my brief stint with the Lincoln Park Zoo in Chicago, I helped treat a constipated jaguarundi. 6. During my brief stint with a fertility clinic, I was invited to contribute a sample to the sperm bank (I declined). Which one of these is the truth? And now, in a big twist, instead of nominating seven deserving people who make stuff up creative writers, I'm going to invite you, the reader, to do so. Leave a comment with a name and a link, and I'll gather them all up at some point in a future blog post as a big, fat liars convention an honor roll of creativity. At that time, I will also disclose which of these seven items above is the truth. Good lies, good lies. I'm guessing 7 but the first one is mighty believable as well. I don't think there is a USS Chicago, unless it is in Lake Michigan. You can't represent a city in the Legislature. I'm sure you probably were to give samples at a fertility clinic due to your good looks and infamous charm-but I don't think you worked there. so, I think #7 is true, that fits you, but then again, you give a lot of details, so maybe you are trying to deceive us. Gee, you are a tough nut to crack. Did I decide? I don't remember. These are really GOOD! I think #4 is true. I'm not picking anyone for you to give this to. That's your hot potato! It's got to be #1. I could see you in a submarine! #3, my dancing in Swan Lake with Milan's La Scala ballet company. In 1986, the company was doing a tour in the U.S., including seven performances in St. Louis, where I grew up. I was in high school at the time and was a serious drama geek. You know those kids in "Glee"? That was me - acted, sang & danced in every show my school put on. Our H.S. director worked a summer job at the theater where La Scala was going to perform. He gave me and several of my classmates the opportunity to fill out the stage for some of the larger crowd scenes. We had a 5 hour rehearsal off-site with the advance team to learn the choreography and polish our steps, and then another 5 hour rehearsal at the theater with the corps de ballet to work out the costume changes and timing. My job was twofold: dance well enough to be smooth & unobtrusive in moving from mark to mark, and perform my steps in place in between transitions so as not to distract from the real dancers in center stage. In my two scenes, I was an innkeeper and a palace guard. I did seven performances in front of an audience of ~9000 people each night. Too bad I've been so honest on my blog - people would be able to catch my lies. Or have I? And would they? See? Jezebel knew that you had culture. Let's see how do you spell flabergasted????? I LOVE it!!! No wonder you write so well, you are a very interesting character yourself! I agree with Karen--photos, we need photos! Surprised? Absolutely! I things it's great. I'm with Karen and G.P. -- pictures are in order : ).